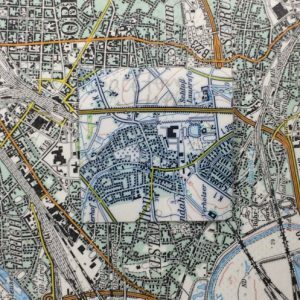 My name is Anna O’Regan and I have recently completed the MA Conservation of Fine Art (Works of Art on Paper) at Northumbria University in Newcastle. 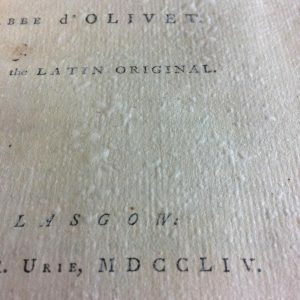 Before starting the course, I volunteered with the National Library of Scotland, doing basic conservation work on books, maps and pamphlets, including surface cleaning; surveying and auditing; re-housing collections; and creating Melinex dust covers for books. After finishing my MA, I contacted the Library to see if I could return to undertake an internship there. 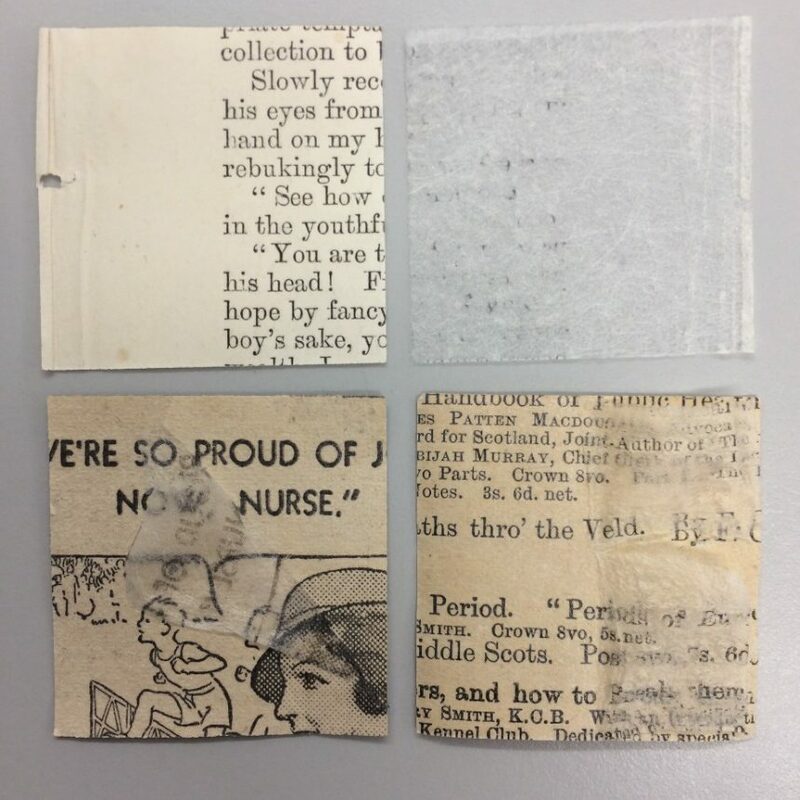 Isobel Griffin and Claire Thomson from the Collections Care Unit suggested a potential research project, for which they obtained funding from the Library’s Innovation Fund. The aim was to develop a methodology for removing area bonded fibre laminates (ABF) from paper-based objects at the Library. ABF is a nylon tissue coated on one side with a synthetic acrylic adhesive. 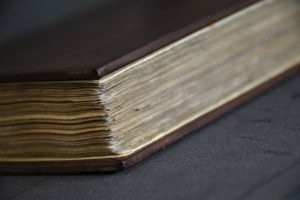 It was used by the Library in the 1970s and 1980s to preserve, protect and reinforce many rare books, manuscripts and maps. In some cases, this now outdated treatment has remained intact on these objects (see figures 1 and 2). 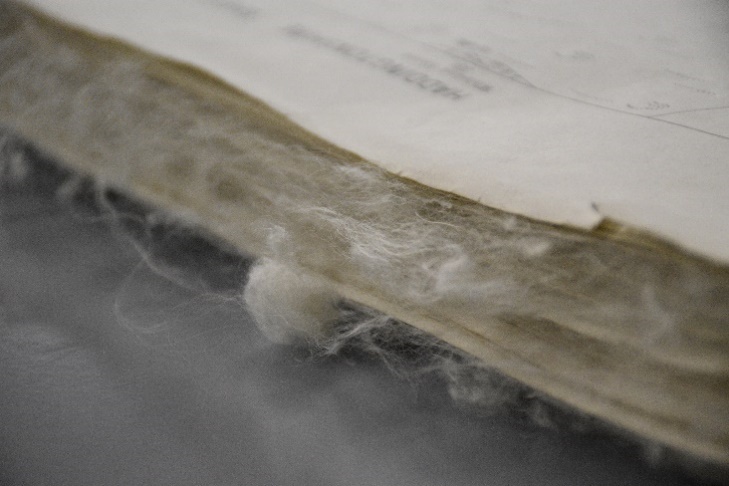 It has also protected brittle, acidic documents, keeping them in one piece and able to be handled. 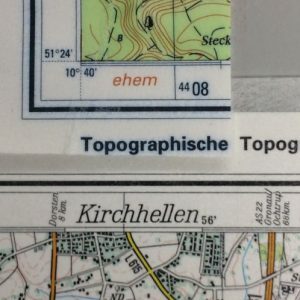 Figure 1 – A stack of maps with ABF in good condition. There are, however, many other examples where this treatment has not aged well (see figures 5 to 8). 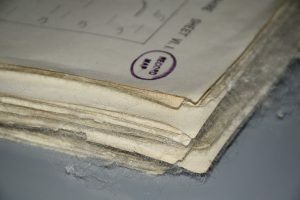 These documents show a number of issues, from bubbling and delamination to excessive fraying along the edges, resulting in a ‘cobweb’ appearance and attracting surface dirt. 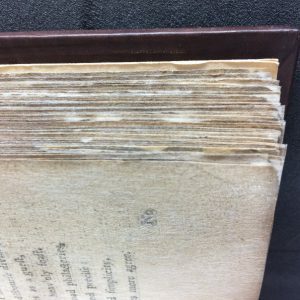 Besides being aesthetically displeasing, the poor condition of the ABF affects the handling and safety of the objects, and the ABF has often become opaque, obscuring the text. It is these reasons that necessitate its removal. 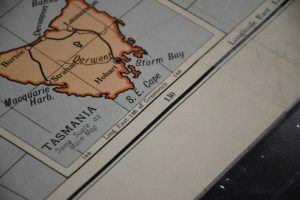 Figure 5 – Frayed ABF on maps in a plan chest. 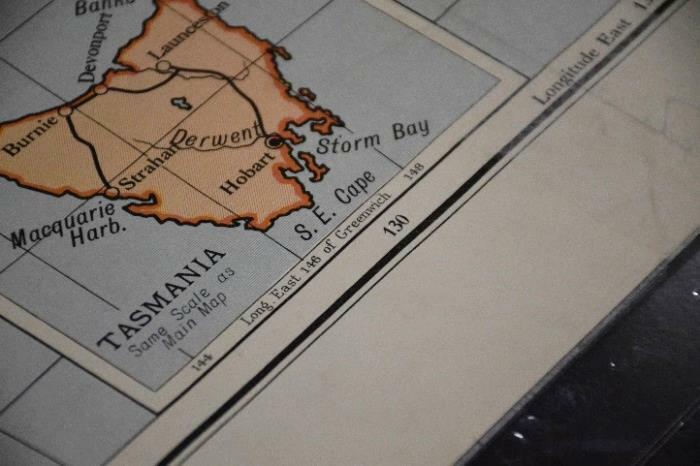 Figure 6 – Frayed ABF on maps in a plan chest. Figures 7 and 8: ABF is bubbling and obscuring the text. NLS shelfmark Jolly.2217. 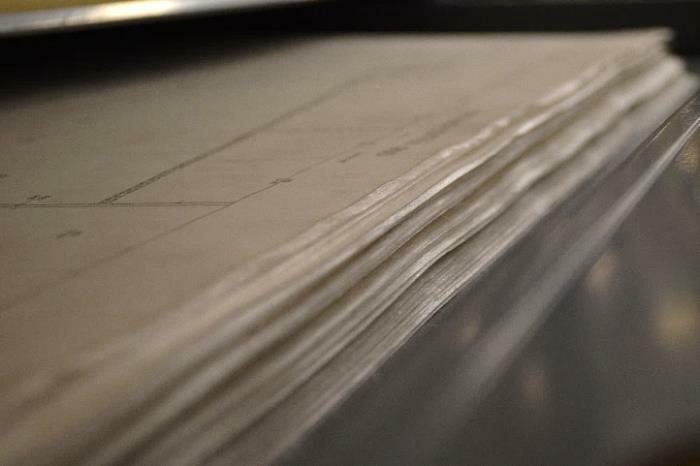 ABF was used with the best of intentions to strengthen and protect documents, although it was sometimes applied to objects that did not need it. 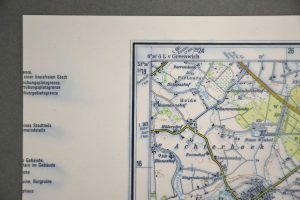 The Library discontinued this treatment on manuscripts and printed books in the mid-1980s, but its use on maps continued until the early 2000s. 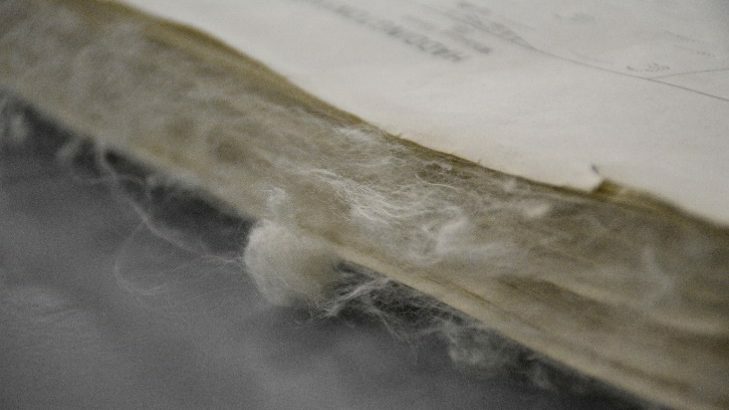 It was discontinued due to the visible ways in which it was deteriorating; concerns about whether it was an archival-grade treatment; and concerns about how easy it would be to remove in the future. 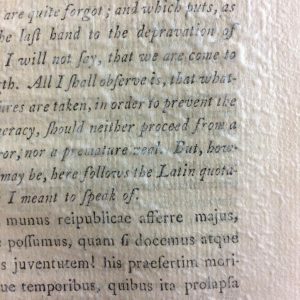 The Library would now like ABF to be removed from some objects , so they can be digitised, displayed or simply read without the obscuring ABF. Given the lack of literature on ABF and its removal, my internship was focused on finding suitable methods that could be executed quickly and efficiently. It was hoped that my research could be applied to the mass treatment of objects covered with ABF. minimal health and safety issues associated with treatments. Figure 9 – ABF viewed under specular light showing a control sample (left) compared to an ABF sample (right). 12.8 magnification using a stereomicroscope. Figure 10 – ABF viewed under raking light showing a control sample (left) compared to an ABF sample (right). Bearing in mind the potential damage to an object that might result during ABF removal, it was decided to test the least interventive methods first before turning to more interventive methods, typically involving large amounts of organic solvents. Removing the ABF dry was tested first, followed by a heated spatula, cold water immersion, hot water immersion, gels and poultices with and without organic solvents, organic solvent vapour delivered through SympaTex®, organic solvent washing on a suction table, organic solvent blotting paper washing and organic solvent immersion. 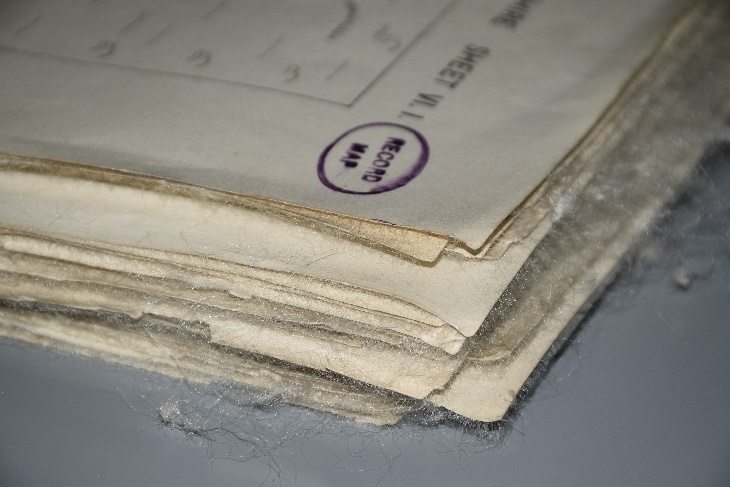 The results were put into three main categories: carrier and adhesive removed successfully, with no disturbance of the ink or fibres; carrier removed but adhesive left behind; unsuccessful attempt – carrier and adhesive left behind. As predicted, it was found that the carrier could be detached fairly easily by pulling it off with tweezers, but the adhesive layer was left behind. However, it was thought that removing the carrier might sometimes be beneficial as a precursory treatment to reveal the adhesive below, which could then be removed using other methods. The heated spatula method was less successful than dry removal, because although it was again possible to detach the carrier, it appeared that the adhesive became further embedded in the paper substrate. Aqueous immersion methods did not yield noteworthy results. The carriers still had to be removed mechanically, and for most samples the adhesive layer was left behind. 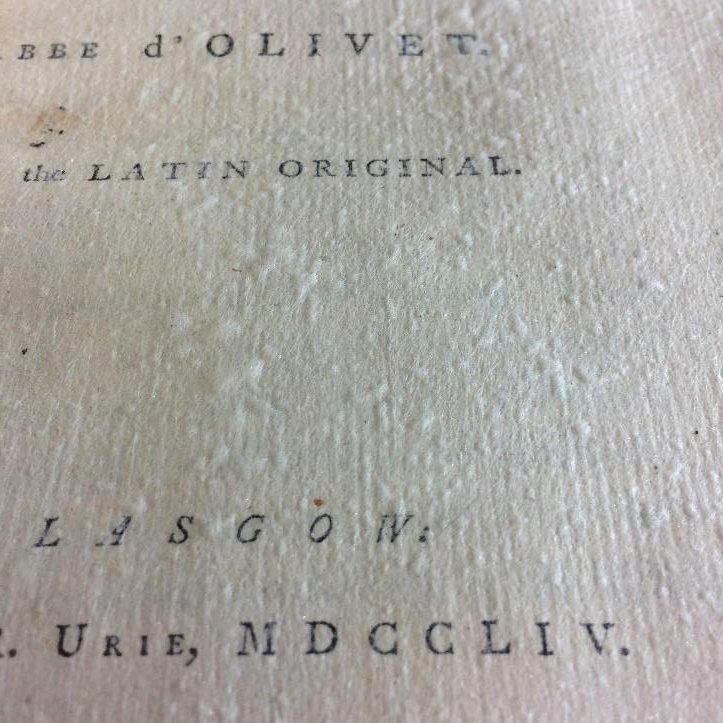 There were some samples for which the adhesive came off along with the carrier, but in these cases the paper fibres and ink were often disturbed. 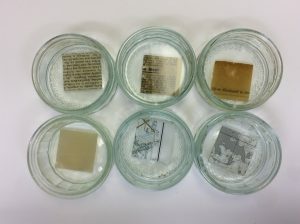 Figure 11 – Hot water immersion to three different sample types showing the removal of paper fibres and media as a result. Water was also applied using gellan and agar gels and a laponite poultice. None of these were very successful at removing the carrier and adhesive without disturbing the ink or paper fibres, and they took too long to warrant upscaling them to larger objects. It had been hoped that using acetone vapour delivered through a microporous tissue might be an effective method for removing the carrier and adhesive, as described by Dr Lora Angelova at The National Archives in Kew (see her blog post), but unfortunately this method was not successful for the Library’s samples. Further testing before dismissing this method could include experimenting with using more layers of acetone-soaked material (e.g. blotting paper) under the SympaTex® in order to increase the amount of vapour within the chamber. 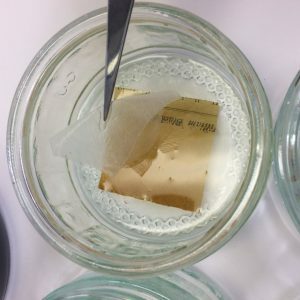 Soaking blotting paper with acetone or IMS and placing the samples in direct contact with the blotting paper was partially successful. 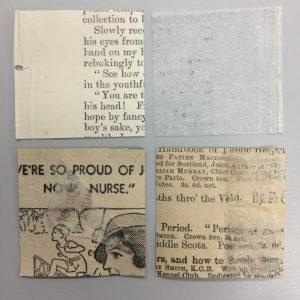 However, the removal of the carriers was slow and further direct contact between the adhesive and the blotting paper was required before the adhesive could be removed. This prolonged exposure tended to result in shifting of the media on the samples that were fugitive. 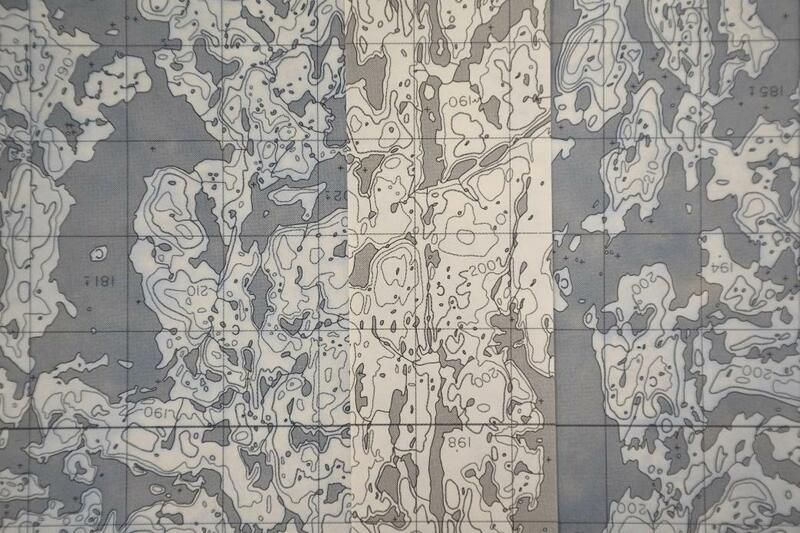 Figures 12 & 13 – The black and white map sample after direct contact with the IMS-soaked blotting paper,with a control sample over the top (left), and the coloured map sample after direct contact with the IMS-soaked blotting paper. 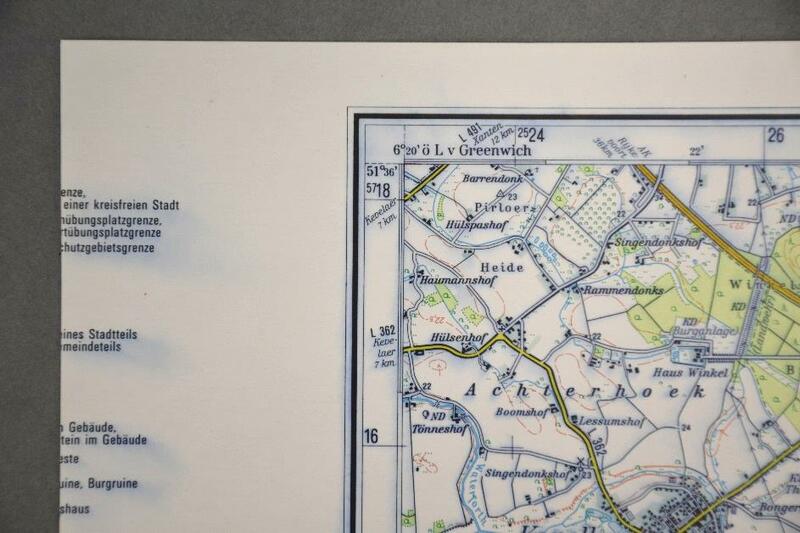 Figures 14 & 15 – The shift in inks on two coloured map samples both placed over larger untreated samples for comparison. Acetone immersion was by far the most effective method of removing both the carrier and adhesive in one go. In all tests the carrier was detached almost immediately taking most of the adhesive with it. 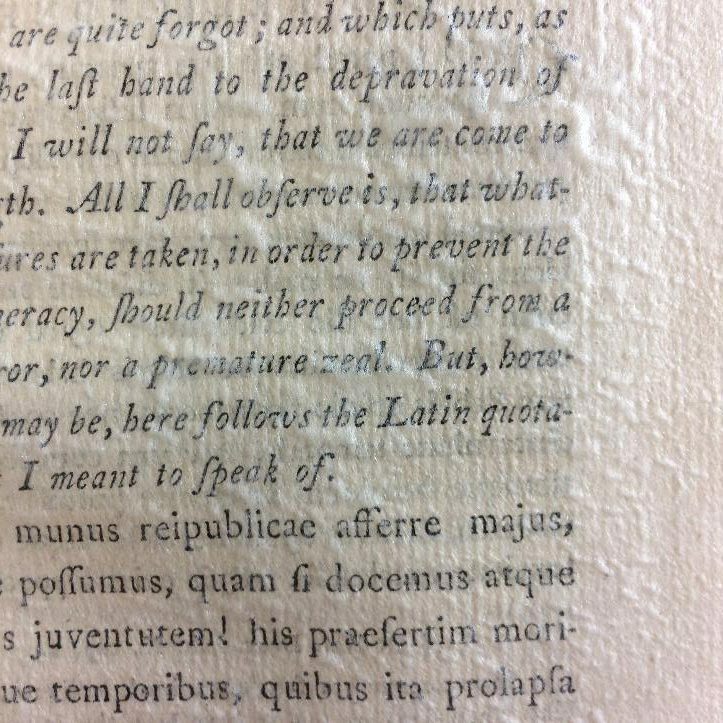 Remaining adhesive could be removed by swabbing, although this caused some shifting of the newspaper ink. Hence this method seems the best option, providing that the solubility of the ink is tested beforehand. Of the other organic solvents tested, IMS was the next best and gave reasonable results for the removal of the carrier and the adhesive, although it took longer to work than acetone. Given that acetone and IMS have similar health and safety implications, and that IMS is no longer available, with the alternative being Industrial Denatured Alcohol (IDA) which seems less effective than IMS, the use of IMS/IDA is not a preferred option. There are health and safety and cost implications regarding the quantities of acetone that would be required to remove ABF from large items with the immersion method. Cost could be addressed to some extent by re-using the same bath of acetone, until the ratio of solvent to adhesive reached the point where the acetone was no longer effective. When using the immersion method for large objects, the logistics would have to be considered carefully. 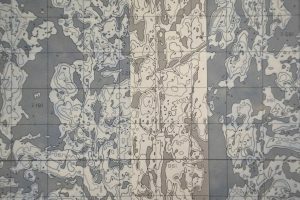 For example, the treatment would need to be completed as quickly as possible to avoid causing the ink to shift. My recommendations for further research are that variations of the acetone vapour method should be tested, to see if it can be successful in at least some situations. A method of applying this and/or the acetone immersion method to large format collection items should be developed, with the aims of maximising efficiency and throughput and minimising health and safety issues.